First of all, I want to insist on what Free Payment is not. Free Payment is not about charity, kindness or generosity. For the consumer of Free, it is first and foremost a selfish business act. The consumer pays to secure his future happiness. Because he loves the product and he is wise enough to understand that he needs to contribute if he wants the producer to make more for him to enjoy. For the producer of Free, accepting free payments is not panhandling. Free payments are deserved remunerations for the producer’s work, even more merited since the consumer freely chooses to pay. It is a sign of approval and an encouragement to pursue. A free payment is a business transaction. It is a transaction based on love, passion, wit, and above all, freeness, but a business transaction nonetheless. This being said, I want to elaborate on the staggering advantages of a Free Payment culture for consumers, producers and societies. The consumer is free to choose which producer to pay, and which not to pay, whatever his reasons are. And in all cases, he can still enjoy the content or the service freely. The consumer chooses to pay only for what he values from the maker. He can choose to pay for a copy, a performance, a service, for a future product or for the overall work of the producer. The consumer is free to choose how much to pay. He can pay a suggested price, according to market value or according to his own perceived value. He is free to take into account his own capacity to pay. For any reason he might have, he can choose to pay less, or more, with no need for justification. The consumer is free to pay any time he wants. He is free to pay now, later or never. He can choose for example to postpone payment until he can afford it, or spread out payments in time. The consumer can choose to pay for his own reasons. Because he loves the product or because he respects the maker. It may be a way to congratulate or to encourage him, or because he feels the producer’s work is important for him, for the community or for the world. Through a community, the consumer gains the power of life and death over the destiny of the producer of Free. With Free Payment, he acquires the ultimate tool to exert its power and influence over its economic space. It opens up endless opportunities for consumers willing to get involved into the producer’s business. The consumer will gain an almost unlimited choice of contents and services. Because Free Payment greatly contributes to a profitable Long Tail economy, the consumer will benefit from unparalleled market diversity. Free Payment is by far the easiest and cheapest business model to implement on the Internet. It allows for a very low market entry cost. A producer can post his writing on a blog, his video on YouTube, his picture on Flickr, his music wherever, and get payment from PayPal. Minimum up front investment required. Minimum overhead. Free Payment gives the producer the opportunity to eliminate middlemen from his business process. Since Free Payment allows for a direct link with consumers, it enables the producer to optimize its cost structure and provide the lowest cost content and service to his community. The Producer is free to make his work available under copyleft licenses, and thus fully embraces the Free Culture ethos. With Free Payment, the producer of Free does not need to care about copyright infringement, DRM or other legal and technological protection for his work. Free Payment allows for a much more leveled field of opportunities for all types of businesses and products, even the more specialized one. With the enormous Internet market, a producer can hope for decent revenues even if his product is located far out in the niche end of the Long Tail. The producer gains the resources of a committed community of True Fans. A community of people who care enough to freely contribute to his work. Properly nourished and fostered, such community of dedicated fans can provide real value in ensuring the producer’s business growth and prosperity. Free Payment is an opportunity to eliminate valueless activities from business processes. Since Free Payment favors direct transactions between producers and consumers, it can greatly contribute in optimizing supply chains for digital goods and services. This means a more efficient economy, less resources consumption and lower environmental cost. Free Payment together with the Free Culture is an environmentally sound economical model. Free Payment can contribute to a better distribution of wealth. Because people are less likely to pay someone perceived as “rich enough”, it will enable consumers to reroute their consumption budget toward more marginal producers. Free Payment is an opportunity to have fewer millionaires but more people able to get a decent living from their work. Free Payment business model can greatly contribute to fight poverty and help developing countries. Because of its very low market entry cost, it offers more equal opportunities to a much greater part of the world population. Finally, for the rebel minded people, it is a way to short-circuit an economic system often seen as unfair and inefficient, a system mostly at the hand of an overpaid privileged corporate elite. To use Saul William words, it’s a way of check-mating capitalism. Surely, this economic system is based on integrity and wisdom. These qualities must be common enough through the Internet community for Free Payment to be a successful model. I strongly believe they are. The best proof is that there is already a thriving Free Culture out there. Wikipedia, Linux, Firefox, they are all very successful products of this ethos. And Free Payment is already playing an important and growing role in this culture, almost unnoticed. Call it donation, patronage or sponsoring, it’s the same fundamental idea. It only needs to be further fostered and promoted. 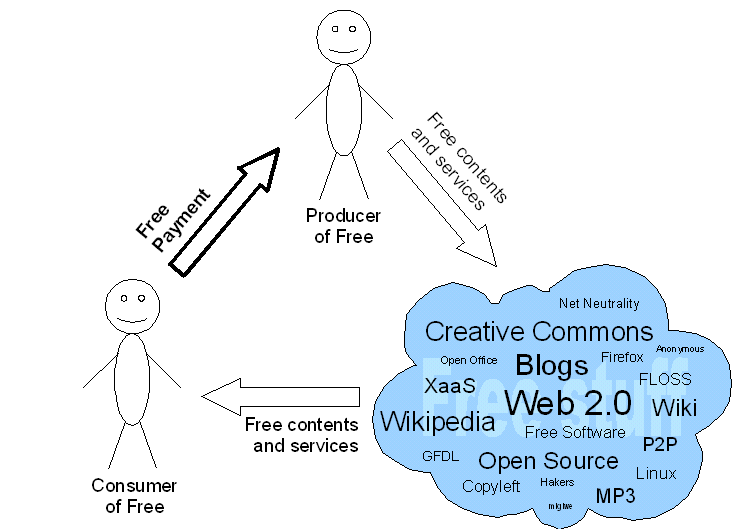 Free Payment is the key to the realization of a sustainable gift economy of Free in the digital world. It is often said that, in a gift economy, people are judged less on what they own and more on what they give. This is quite an exciting and promising new paradigm to explore for our society. As it is now common practice to clarify when talking about such subject, this text is about free as in speech, not free as in beer. From the beginning, the internet has been struggling to find its economic raison d’être. By allowing digital goods to be copied freely and at merely zero cost, it gave a blow to traditional business models, mostly based on selling copies. Since then, no alternate economic model seems to be able to fill the gap. Advertising has long been thought to be the solution. It was the first model to emerge and to achieve a significant success. And it has been since then the main economic propeller of the web. But as impressive advertising revenues growth are, this model alone is in no way able to fulfill the economic needs of the current internet planet, much less to be a guarantor of its future. The quantity of contents produced by “amateurs” who cannot or do not seek monetary gratification is already huge and it’s growing extraordinarily. It is impossible for the advertising model to sustain such growth and diversification. Other business models have been used with some success, such as the Freemium model. But again, like other models based on selling some sort of copies, it is inefficient, unless you restrict the ability of your product to be copied. The internet is a complex animal whose metabolism is based on Free. Any attempt to restrict freeness is condemned, if not to failure, to hopelessly squander resources to fight the natural tendency of the Internet of Things to revendicate this freedom. This is why all efforts to enforce copy protection have proven difficult, if not impossible. DRM mechanisms are dead ends in this digital world because they go against the fundamental nature of the internet, the free circulation of data. The internet is the realm of the Free. But, as economists like to say, there is no free lunch, not even in Cyberspace. So, how can you make money with Free stuff? There are many promising solutions currently being explored. Kevin Kelly’ texts Better Than Free and 1,000 True Fans are the best reflections on the subject I know of. He defines 8 “generative” values that can be exploited in a world of Free. Most of them are already being used to some extent, like “findability” (iTunes, Netflix), others are barely exploited. But so far, none of these models seems to possess the potential to successfully propel the internet into the much announced new digital economy era. Wait, maybe there is one. Let’s chart the economic process of Free. If you look at this diagram, there is one clear conclusion. In order for this process to be economically viable, you need to close the loop and provide some kind of value exchange from the Consumer of Free to the Producer of Free. This is obvious and only restates our original problem: how can we close the loop and give a smile back to the producer? Some might argue that since a Producer of Free is almost certainly also a Consumer of Free, he gets some payback by taking advantage of other’s Free contents and services. Like in a Gift Economy. It is all true and good, except that this doesn’t put more money into his pockets (although it certainly helps). If you look again at the diagram from a very high perspective, there is one obvious label for the missing link that readily comes into mind. Free Payment or payment libre. A payment that the consumer is free to make, or not to make. A payment free of any mandatory value. A payment libre of any constraints. The Free Payment model is an intuitive, natural, elegant and simple solution to the Free Culture economic dilemma. So much that it’s already all over the place and used since the origin of the internet. It is called patronage, donation or sponsoring, but it’s exactly the same idea. And it’s growing steadily, almost unnoticed. Because people want to pay. Those arguing that people will never pay for something they can have for free, grossly underestimate humankind intelligence and common sense. Because it is only common sense to pay for something you use and enjoy. This way, you make sure there will be more in the future. You secure your future happiness. It is the clever thing to do, in a selfish way. Doing otherwise will end up inevitably killing the creation of Free, and people are wise enough to understand it. But Free payment is above all a question of passion and love. Love for an artist, for a writer, passion for a community. It is “a way of connecting, a sign of approval, a vote, it indicates an allegiance with the maker, and it feels good to the payer“. I strongly believe that Free Payment, together with “Better Than Free” generatives, represents a solution, if not the only solution to the economy of Free. Because it respects and reinforces the ethos of the Free Culture and of the internet. It is a way to concretize the promises of the Long Tail. A way to give hope and relief to the countless creators of the web. A way to sustain and defend the unprecedented explosion of creativity and inventiveness triggered by the internet. It is at everyone’s interest, producers of Free and consumers of Free. And it just needs to reach a critical mass of participants to become a real economic revolution. For this to happen, the culture of Free Payment only needs to be marketed and fostered, because the seeds are already there. Many people give their time, talent, creativity and money into the economy of Free. It is called Open Source, Web2.0, Online Communities, Blogs, Wikipedia… and Free Payments, all part of the Free Culture revolution. Free Payment might be the missing link toward the realization of a thriving and sustainable Gift Economy of Free. Because Free Payments are truly gifts. Some might say that gift economies are pure utopias. I know of a bunch of utopian people who, once a year, create an amazing gift economy society, out in a remote desert of Nevada. And they build pretty incredible things. It is called Burning Man. They know and I know that utopias are quite often very possible futures. It only depends on us.